The Avg. Group Discount is 8.1%! OHANA Waikiki Malia is a sensible choice for the practical traveler. Situate yourself in the heart of Waikiki enjoying the fresh ambience of recently upgraded Waikiki hotel guest rooms. 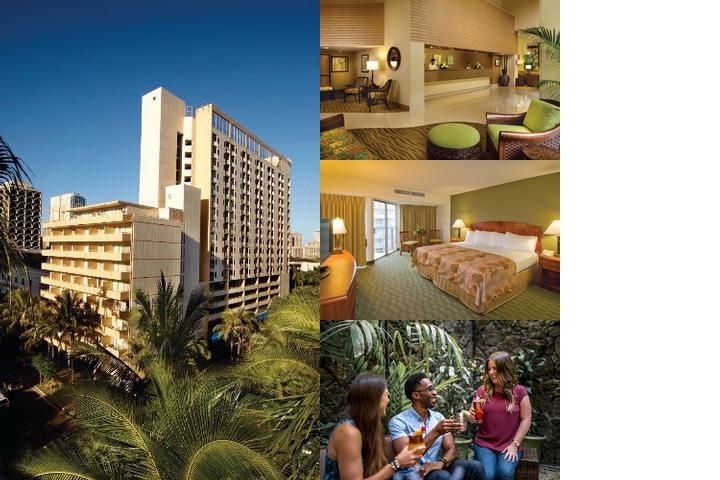 OHANA Waikiki Malia hotel offers connecting rooms and many rooms with 2 double beds, providing flexible lodging for families and groups. Also available are 1 bedroom kitchenettes suitable for 4 guests. On-site IHOP restaurant is open 24 hours, and Rivals Waikiki sports bar is designed for the dedicated sports fan with 14 HD televisions streaming satellite broadcasts until 2 am. OHANA Waikiki Malia is just a 5-minute walk to luxury shopping on Kalakaua Avenue and 7-minute stroll to Waikiki Beach. The city bus stop is a 3-minute walk from the hotel for self-guided touring around Honolulu. Or use the pass to hop on the Waikiki Trolley next door at DFS Galleria, included in the OHANA Waikiki Connection, and sightsee all the way to Ala Moana Shopping Center. Looking for value-packed travel deals at Waikiki hotels in Honolulu? Choose OHANA Hotels! A 100% of stay deposit is required upon signing of contract and is non-refundable.Flexible contract terms available, rates are subject to change. Breakfast availabile on property at IHOP Restaurant. Additional Fee apply. $35 per car per day Self-parking onlyMaximum height limit is 6'2"
Included in the Resort fee. The Outrigger Hotels Hawaii highlights above are subject to change without notice. 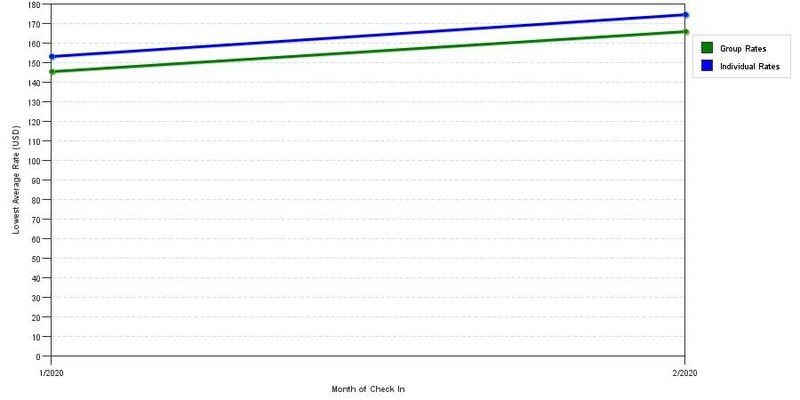 The graph above is fluctuations of room rates for both group prices and the lowest online individual prices our system could find at the time the group bid was submitted. The lowest group discount displayed is 13.9% in the month of September 2017 and the highest average individual rate is $220 in the month of January 2020. This chart will show past seasonality and also project future months. If you are flexible with dates, you may want to consider staying at Ohana Waikiki Malia by Outrigger in a month when rates are lower.